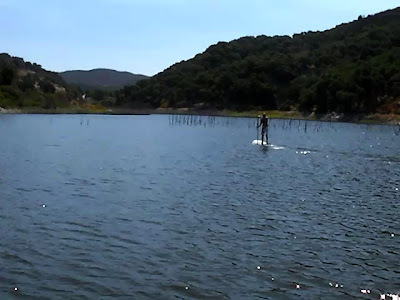 Stand Up Paddle Surfing: On the road: Central California and Cabo- Let me catch my breath. On the road: Central California and Cabo- Let me catch my breath. Been on the road. In the last couple of weeks I've wandered through Central California and scouted out some coastal runs near Cabo San Lucas. That's a lot of traveling for a guy who gets excited by a twenty minute drive up the coast to La Jolla Shores. I've got pieces in the works for those trips but right now I'm beat. Give me a chance to catch my breath and I'll get those stories up soon. Here's a photo of my girl paddling in the Lake Lopez thule zone. Stu's Stand Up Routine: There's been a reasonable amount of interest in the Stu Kenson article- particularly the board he calls the Alligator. So here's a couple more photos of the thing. It's 11'6" by 29", a really forgiving board that paddles responsively and surfs beautifully. This is a board that would suit the first steps of a beginner yet still satisfy an expert paddler/surfer. I don't think anyone will outgrow this board in three months of use- there's just too much performance built into it. The Alligator: Don't get bit! By the way, the color matched tape on the paddle was pure coincidence- really. Stu Kenson: Yep- he builds them and he surfs them. In and early at the Imperial Beach Pier.